My long-awaited copy of Pokémon Black arrived while I was in Kauai. I have yet to pop it into my DS, as I'm still spending time with Final Fantasy: The 4 Heroes of Light, but I'm planning to trade the latter for the former sometime this week. I'm not in any particular rush at the moment because I haven't decided which starter Pokémon--Tepig, Snivy or Oshawott--I'm going to pick. Although I'm leaning towards Tepig (right), Snivy is appealing, too. Another reason I'm not in a rush to start this particular Pokémon adventure: I've been a bit ho-hum on the series since I brought home Pokémon Emerald many moons ago. I'm hoping Pokémon Black will reverse that trend, but I'll hardly be heartbroken if it doesn't. Anyway, enough about me. Have any of you picked up the latest Pokémon title? If so, which starter did you choose, and what are your overall thoughts on the game thus far? Mine just arrived today. I haven't even started it because we've been running errands and crap. But...I'm taking Tepig, as you may know. We shall see if I love it or its meh. Oh, I'm glad you got your copy, too -- I know you've been waiting for it. I'll probably start it tomorrow night. 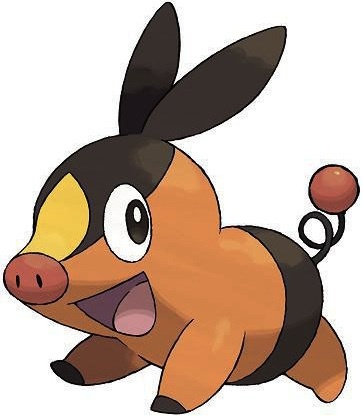 Like you, I'm going with Tepig. Well, I've passed the first gym leader. So far? Pretty much like a basic Pokemon experience. I feel like this one moves pretty quickly. Of course, I haven't played one since Red, so...maybe it moved this fast, too? Either way, I'm getting in to it.